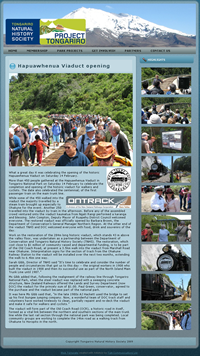 While website design is not a major part of the business at present I am very proud of the Tongariro Natural History Society's website www.tongariro.org.nz which I designed and also maintain. full details of volunteer opportunities and field trips. Several other websites are in the wings - watch this space! If you want a website, simple or complex from basically an online brochure of your services to one where you can sell your products email or phone me and we can discuss get a site underway for reasonable cost.